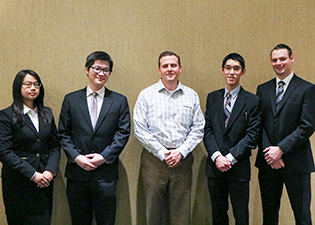 The SIU team of Po-Jui “Jerry” Lien, Noppadol “Champ” Tuksakulvith, Doug Zurbriggen and Irene Chua qualified in the initial rounds of the competition Jan. 29, and then received a plaque and a $450 award for the SIU chapter during the closing ceremony of the final round. The finals included 34 teams from business schools throughout the Midwest, including the University of Illinois, Purdue, Indiana, Bradley, Indiana State, Illinois Institute of Technology and Northern Illinois. The winner of the Chicago competition, Loyola University, will compete in the APICS World Student Case Competition in San Antonio. SIU’s APICS student chapter is sponsored by the Fox River Chapter of APICS and the Department of Management in SIU’s College of Business. The student chapter provides exposure to real-world supply chain management through speakers, plant tours, and events such as the case competition. The SIU APICS team members also demonstrate how students can come to the SIU College of Business and make a substantial impact on the college, and their own futures, by taking initiative and working hard. “I also tip my hat to our dedicated faculty in the College of Business, who provided opportunities in the classroom for them to gain the knowledge and insight they needed to compete well against these schools,” Goodale added. For more information about how to get involved with the chapter, contact its president, Po-Jui “Jerry” Lien, at jerrylien@siu.edu or faculty sponsor John Goodale at jgoodale@business.siu.edu.